A swirling storm of burnout among pastors and spiritual leaders is brewing right under our noses. The eye wall has hit land. The storm surge threatens to drown out the Church’s collective voice and dilute its influence in our culture. The question is… what can we do? We must recognize the storm is here, realize it could get worse… but understand it doesn’t have to. 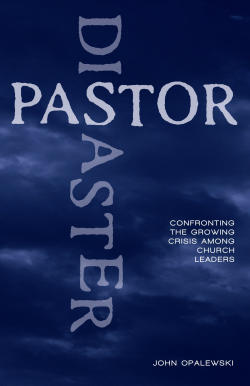 This practical guide, written for pastors, leaders and churchgoers, identifies the real problems behind the current leadership crisis and provides workable solutions that will strengthen leaders and help the Church re-establish its influence. “My life is over!” I choked out over the phone to my best friend as tears bounced off the kitchen counter. It was a bone-chilling, rainy night in November 1992. Weeks of little to-no-sleep combined with a lack of appetite due to excessive anxiety finally came to a head. My emotions were spinning out of control, I was suicidal and contemplating the least painful way to end my life – and I was the lead pastor of a growing church. Unfortunately, mine is not an isolated experience. A Category 5 hurricane is battering the Church. A swirling storm of burnout among pastors and spiritual leaders is brewing right under our noses. The eye wall has hit land. The storm surge threatens to drown out the Church’s collective voice and dilute its influence in our culture. Making matters worse, many pastors in distress cannot put their finger on what is wrong. I didn’t know what was happening to me, making the emotional crisis doubly terrifying. Fortunately, I had wise friends, a good medical doctor and a competent counselor who identified the problem. Clinical depression had brought my world to a crashing halt. Up to that point, I had little room in my theology for depression. It was something that happened to weak-minded people, not to a spiritual leader. After all, I had been walking with God for eighteen years. I had been a pastor for twelve years. The spiritual disciplines of Bible study, prayer and Scripture memory were part of my daily routine. How could this happen to someone like me? In that dark moment, I felt as if God betrayed me. What I didn’t understand then was the pervasive nature of depression in our world – even in the church world. I somehow overlooked the depressive episodes of King David, and the prophets Elijah and Jeremiah, even though I read about them multiple times. I failed to recognize that spiritual giants like Charles Spurgeon, Martin Luther and John Calvin all suffered from this affliction. One of the greatest presidents in our nation’s history, Abraham Lincoln, battled with depression. In an article written by Joshua Wolf Schenk we read: “He (Lincoln) often wept in public and recited maudlin poetry. He told jokes and stories at odd times—he needed the laughs, he said, for his survival. As a young man he talked more than once of suicide, and as he grew older he said he saw the world as hard and grim, full of misery, made that way by fate and the forces of God. “No element of Mr. Lincoln’s character,” declared his colleague Henry Whitney, “was so marked, obvious and ingrained as his mysterious and profound melancholy.” His law partner William Herndon said, “His melancholy dripped from him as he walked.”1 The emotional experiences of these men we consider larger than life reveal that depression is no respecter of persons. The number of people battling depression is staggering. Estimates range anywhere from 20 million to 23 million people in the United States; and as many as 340 million worldwide, depending on the statistical source. According to Mark Tyrell, founder of Depression Path Learning – major depression is the No.1 psychological disorder in the western world. It is growing in all age groups, in virtually every community, and alarmingly, the growth is seen most in teenagers. At its current rate of increase, it will be the 2nd most disabling condition in the world by 2020, only behind heart disease.2 We are witnessing an emotional epidemic. Depression feels like you’ve plunged off a cliff into a black hole of sadness. It possesses the ability to engulf you to the degree you feel like an emotional zombie. Listen to the words of an anonymous depression survivor: “When I was depressed and I looked out my window, the landscape looked absolutely flat and colorless.” Jesus in the Garden of Gethsemane told His friends “My soul is overwhelmed with sorrow to the point of death.” Jesus hit the nail on the head. Being overwhelmed with sorrow to the point you feel dead on the inside describes depression precisely. Depression is not something that responds to the sheer force of our will. Recovery from this affliction is not a matter of pulling yourself up by your own bootstraps. You cannot way out of depression. I remember negotiating with God while in the middle of the black hole – “Lord, if you get me out this, I’ll do whatever You want me to do.” My hope was He would deliver me instantaneously. God had other plans. Depression often rears up when least expected. Elizabeth Sherrill in a 2003 Guideposts article writes: “The terror of depression, the dark mystery that distinguishes it from sorrow, is that it can cast its gray pall about us when the sun is the brightest.”3 In 1992 I had (and still have) a wonderful wife and 4 healthy boys. The church I served as pastor was enjoying excellent growth spiritually, numerically and financially. Externally life was good, but internally I was an emotional train-wreck. The professional counselor I sought out to help me get to the bottom of the depression opened my eyes to see the truth. And the truth was this emotional crisis that seemingly “came out of nowhere” in November 1992 had been building for years. The unique pressures of pastoral ministry forced to the surface my flawed approach to mental and emotional maturity. My total disregard for sensible scheduling and ignorance of how to handle difficult people finally caught up to me. And consequently I found myself in the battle of my life, hanging on by a thread. A significant number of pastors across the country could substitute their name for mine and it would accurately reflect their own story. In chapter 1, we will provide sobering statistics relative to pastors and their health. Church leaders are in crisis. And because we are not willing to let them drown, my wife and I have begun an intentional journey to reach out to leaders and their spouses who are overscheduled, over-committed and seriously stressed-out. When we work with pastors we encourage them to adopt a leadership model that includes a sound approach to mental and emotional health, proper boundary-setting in terms of relationships and schedule, and the priority of a leader’s family over his or her profession. In John 10:10 Jesus said “I have come that they may have life and have it to the full.” We believe He intends for His people to have fullness in both their personal life as well as their ministry. We dream of a day when leaders experience a life that is fulfilling, fun, joy-filled and meaningful. We envision leaders who are healthy – spiritually, mentally, emotionally, physically and relationally. We believe that leaders who serve and lead from a position of health are more effective and able to last longer in their role. That brings me to the reason for writing this book. I spend a fair amount of time teaching and preaching the message of emotional health in churches. The response has been overwhelmingly positive both from church attendees as well as their leaders. I have discovered that leaders often struggle with depression. The primary leadership paradigm that has been taught, modeled, encouraged and adopted by many pastors has contributed significantly to them leaving the ministry in droves – disillusioned and depressed. The purpose of this book is to put forth a new model for consideration. The hour is critical. The need for sound, practical biblical teaching regarding a healthy model for pastoral leadership has never been greater. The pages that follow are written with passion for pastors and out of the fires of my personal experience. It is my hope that the content will help you to prevent experiencing depression altogether, or shorten your recovery time if you are currently battling the affliction. The book is organized into 2 sections: Section 1 addresses a pastor’s personal life. Section 2 addresses a pastor’s professional life. Even though I use masculine pronouns throughout the book when referencing pastors or leaders, it is written for both male and female ministers. The Yearbook of American and Canadian churches reported that there were 600,000 clergy serving in various denominations in the United States.4 The 600,000 figure did not include independent churches which were unassociated with a denomination. The Faith Communities Today 2010 national survey of a fully representative, multi-faith sample of 11,000 American congregations, found that 12% of all congregations in the United States had a female as their senior or sole ordained leader. All quotations from the Bible are from the New International Version, unless otherwise noted.